Hey Guys! My name is Ashley Leonetti and I am super excited to be teaming up with Further Food to talk about the benefits of their 7-Day Sugar Detox as well as share with you guys one of my favorite low sugar smoothie recipes. A couple years ago, I started to realize just how much sugar I was consuming and it was a lot! I definitely have a sweet tooth, and even though I follow a clean eating diet, I realized I was eating a lot of sugar, whether it was processed or natural. So I had to make a change! 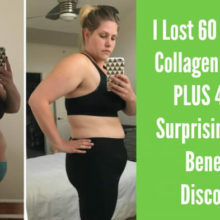 I was having a lot of belly issues – when I was doing my research one of the things that came up was Further Food’s Collagen Peptides. These Collagen peptides are super helpful for different things. I just add some into my morning smoothies and not only have I seen a huge reduction in my sugar cravings but also in my energy levels and my fullness, as well as my muscle repair and my nails, skin, and hair! Following one of these sugar detoxes has made me understand just how much sugar I was eating and also made me realize how good I felt when I wasn’t eating it! It is something I always recommend to my clients. So I am going to share one of my favorite smoothies whether it is morning, afternoon, or night. It is really tasty. Start with a cup of almond milk, and then I add in a scoop of Further Food’s Collagen Peptides and a scoop of high-quality protein powder. As for fruit, I use about 1/3 cup of blueberries because they are low in sugar and I use maybe a cup or a cup and a half of frozen cauliflower. This is going to add some bulk to your smoothies and a whole lot of nutrients and it is pretty neutral so you can’t taste it. Then, I add two handfuls of spinach which is also neutral in taste. And then of course, add your favorite nut butters – about 1-2 tablespoons – to keep you full and satisfied. And then I usually add another tablespoon of fat, whether it be flax seeds or chia seeds. Lastly, I add in a couple shakes of cinnamon and maybe even a pinch of pink Himalayan sea salt. Blend it all up in the blender and the end result is a deliciously thick green smoothie. Typically I top it with some fun ingredients like granola or some nuts to keep sugar low and to make it a satiating meal! I hope that you enjoyed this and find it helpful. I hope you join me on the next 7-Day Sugar Detox that starts on September 11. Head over to Further Food’s website and take the pledge. This is a great smoothie to start your day or have as a mid-day snack. It packs a bunch of hidden nutrients with the cauliflower and spinach which is quite tasteless. Cauliflower has a good dose of vitamin C, vitamin K, and B vitamins, as well as dietary fiber and omega-3! Spinach is a dark leafy green which balances out any meal with tons of vitamins and minerals. Further Food Collagen Peptides are a great addition to this smoothie. Adding collagen to your diet can have amazing benefits, such as repairing your gut lining, balancing blood sugar levels, and keep your skin, bones, hair, and nails strong!